The kitchen is the heart of the home, but for many homeowners, it’s the one room they wish they could improve. At Pagenstecher Group, our home remodeling contractors will work with you to create the kitchen of your dreams. 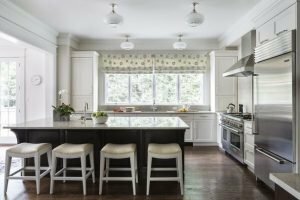 While a remodel may seem like a stressful process, there are a few ways a redesigned kitchen can benefit your family. Reduce Energy Consumption. When you remodel your kitchen, you’ll have the opportunity to replace old and outdated appliances with new, energy-efficient models. Many new refrigerators, dishwashers, and even light fixtures are designed to keep your bills low while giving you the best performance possible. Add Value to Your Home. Older kitchens with poor layouts or outdated appliances will not do much to attract potential buyers. Upgrading your kitchen to a more modern design will help increase your home’s value. Improve the Flow. If you’re unhappy with the layout, a home remodeling contractor will help you find the design of your dreams. Remodeling your kitchen allows you to have complete control over the layout of the appliances and counter space, so you won’t have to put up with a layout that makes food preparation more difficult. Increase Storage Options. Some kitchens are woefully short of cabinets and storage, but remodeling your kitchen will let you add more options to space. Add more cabinets to make the most of vertical storage and maximize counter space with a kitchen island. Improve Safety. Older appliances can be safety hazards. The wiring and electrical systems of old units are not equipped to handle the increased output of the modern energy grid. Newer appliances are manufactured with the proper equipment to handle more electricity without posing a safety risk. Upgrade your kitchen today and see the difference a custom design can make. For more information about our home remodeling services or to schedule a consultation, contact us today.